If you’ve installed Windows 10 Creators Update, version 1703, take a few minutes to make sure you’re getting the most out what Microsoft offers. With Windows 10 Creators Update — version 1703 — now officially declared worthy of installation on business machines, it’s time for Win10 customers to get with the system and get Creators Update installed. 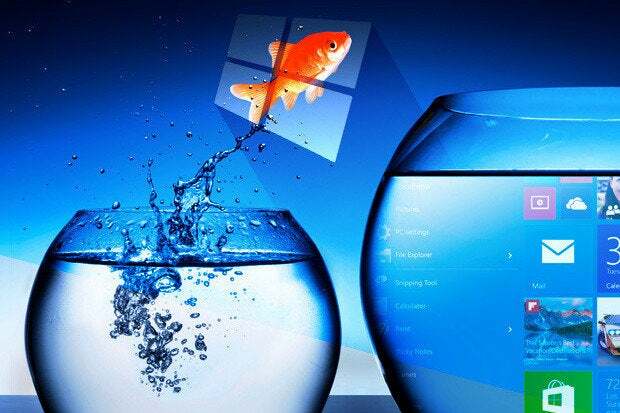 For those who have already moved to the latest and greatest — and those who are just starting with a Win10 machine — here’s a handful of steps you can take right now to keep Windows demons at bay, or at least minimize their hold on your machine. If you’re working with a machine that just installed Creators Update, you should start by running Windows Update manually. 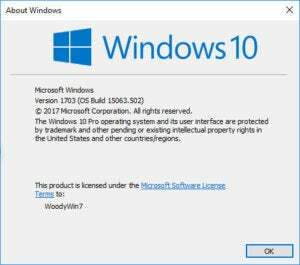 People seem to think that new-out-of-the-box machines and freshly upgraded machines will have the latest version of Win10 installed as a matter of course. Sometimes, they do not. It’s easy to check. Click on the “Start” button (the Windows logo in the lower-left corner of the screen), then on the Settings icon (a gear with eight sprockets). At the end of the list of Settings applets, click Update & Security. Then, on the right, click Check for Updates. If updates arrive and you have to reboot your machine, go back and check for updates one more time. Wash, rinse, repeat. Once Windows itself is up to speed, it’s wise to make sure your drivers and apps are similarly up to date. Updating Store apps should be automatic, but you might want to check and make sure they’ve been handled properly. Click the Store icon down in the taskbar — it looks like a shopping bag — then click on your icon next to the Search box, and choose “Downloads and updates.” Recalcitrant apps should stick out. Updating drivers is tricky. You can’t always trust Microsoft’s drivers — we’ve had numerous occasions recently when drivers distributed through Windows Update carried crazy side effects. The best general advice for getting drivers is to go to your PC manufacturer’s website and follow its instructions. Dell, for example, has the ability to scan your system and tell you exactly which drivers you need (screenshot). 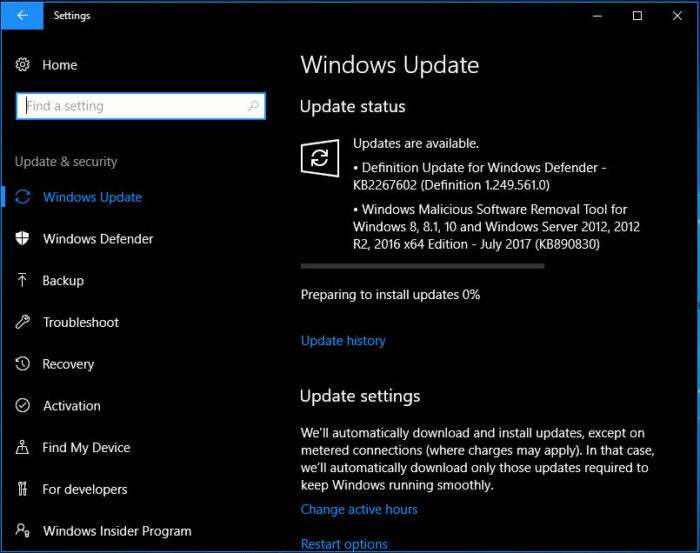 Once you have drivers installed to your satisfaction, it may be difficult to keep Windows’ mitts off of them — although the boorish behavior should’ve been fixed by now, Windows Update has a bad habit of installing its drivers on top of anything it finds. 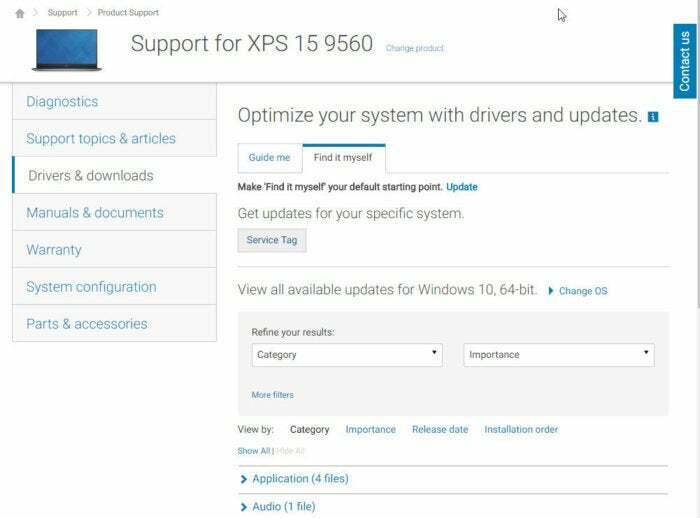 If you discover that your drivers are getting blown away by Win10, follow these instructions to keep them firmly in place. Microsoft wants you to use a personally identified Microsoft Account and sign into it every time you log into Windows. 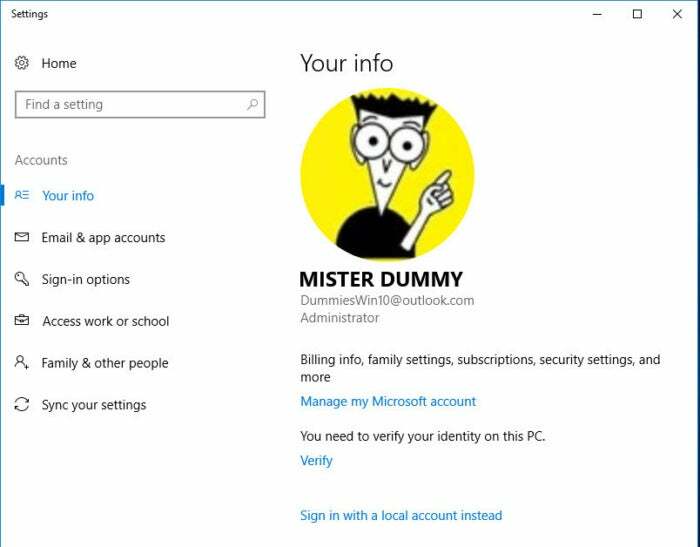 You may want to use a Microsoft Account — doing so will bypass an additional step when using OneDrive, Skype, the Store, Groove, Mail or Office 365. But for many people who understand the implications, the additional benefit just isn’t worth the privacy hit. If you’re a bit prescient, or sufficiently skeptical, you may have originally set up Windows with a “local” account (a “local” account is anything other than a Microsoft Account). If you’re already using a local account, skip to the next trick. But if you’re using a Microsoft Account and want to get off that particular merry-go-round, it’s easy. Step 1. Click Start > Settings, then click on your picture at the top of the stack of small icons at the far left. Click “Change account settings.” You get the “Your info” pane shown in the screenshot. Step 3. Type your Microsoft Account’s password to verify that it’s really you, and click Next. Step 4. Type in a local account username of your choice, password and password hint. Click Next. You’ll be signed out of your Microsoft Account and then given a chance to sign in with your new local account. That new account will be an administrator account, and you’ll be able to use it to control your machine. When you initially installed Windows 10 Creators Update, you had an opportunity to make wholesale changes to your privacy settings. If you’re concerned that you might have made some bad choices, not to worry. You can review all of those choices — in a far more granular way — by going into the Privacy applet in Settings and tweaking to your heart’s content. Just click Start > Settings > Privacy. 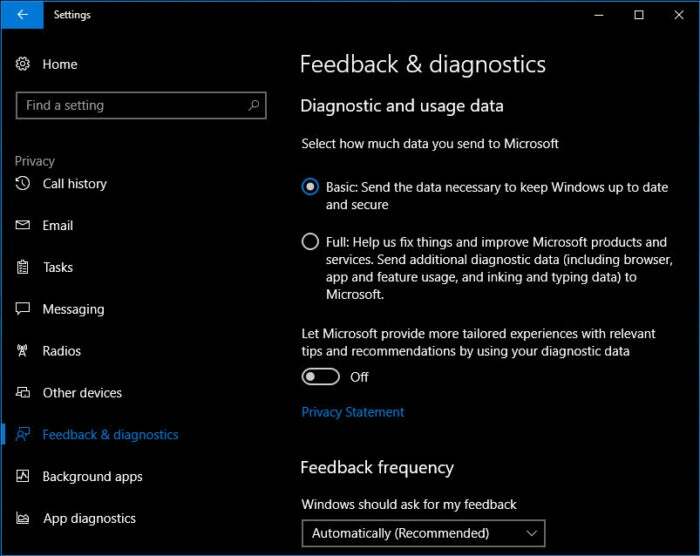 As you’re going through all of the options, make sure you dwell on the Privacy pane called “Feedback & diagnostics” (screenshot). Back in April, I ran through the details of the basic diagnostic setting. 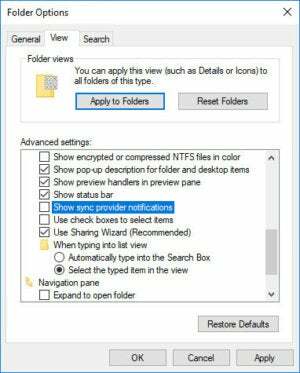 In short, if you choose “basic” here, Windows collects 1,966 separately identified pieces of information about your machine every day, sending the snooping trove to Microsoft’s servers. If you choose full, we have no idea at all what Microsoft collects or sends. I can’t imagine why anyone would go with full. As for using diagnostic data to serve up ads — gag me with a RAMDAC. Maybe I’m old-fashioned, but I tend to think of diagnostic data as being information used to fix problems. Diagnostic, eh? I don’t want Microsoft using my diagnostic data to snoop on me, or to serve up ads, “tailored” or not. While you weren’t looking, Microsoft slipped ads into all sorts of nooks and crannies of Windows 10. At this point there are three separate ad clusters you’re likely to encounter, and a few that only apply in certain odd situations. You have to run around to three different locations in order to quash them. Ad 1. Turn off ads on the Start menu. Microsoft calls them “suggestions,” not ads, and they appear sporadically at the top of the app list on the Start menu. To do so, click Start > Settings > Personalization, then on the left choose Start. Slide the entry “Occasionally show suggestions in Start” to Off. Ad 3. Turn off ads on the lock screen. Microsoft calls it “Windows Spotlight,” and it serves no known purpose other than to get you to click on some clickbait such as “Like what you see?” To throttle these ads, click Start > Settings > Personalization. On the left, choose “Lock screen.” In the Background box, choose anything other than Windows Spotlight. There are other ads in the Notification (“Action”) center — Start > Settings > System. Choose “Notifications & actions” on the left, then pick and choose. And there are ads on the Windows Ink workspace, if you use it. Click Start > Settings > Devices, then on the left choose “Pen & Windows Ink” and slide Off “Show recommended app suggestions.” There are also ads in the Share dialog, but if you use the Share dialog you’re too far gone anyway. And of course, the advertising icons on the Start screen drive many people nuts. Just right-click on anything you find offensive (Candy Crush Soda Saga, anybody?) and choose Uninstall. No doubt you know how to gussy up the File Explorer interface — drag folders to the Quick access list, rearrange them by dragging and dropping, navigate with the up arrow and by clicking on folders in the navigation bar at the top. That’s beginner stuff. Step 1. Down in the taskbar, click on the File Explorer icon. Step 2. At the top, click View. See the screenshot. That’s it. 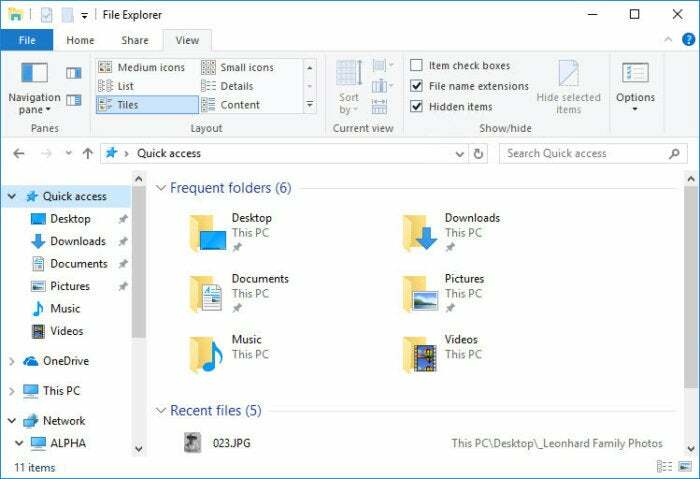 Windows — and some other programs — will start showing you filename extensions, and it’ll show you all of your files, hidden or not.